It is very convenient for self driving tour or train tour. Very easy to park the car and easy to get on your train. The train station is only 50 yards away. I like this hotel. When I arrived on the 16/01 I was told that they had no reservation in my name when I showed them my confirmation from booking.con they gave me a double room-they told me they didn’t have any triple rooms left which is what my reservation was. The room was very noisy at night: the 2 large windows didn’t close properly therefore all the noise from the street and the train station can’t theough quite loudly. My daughter was competing in the World Series archery and we couldn’t sleep well between having to share a bed and the noise, the experience was really bad. The next day I was told that I had a reservation from the 17th and when I asked to be chamgesnthey told me that the room was no longer available. I explained how important it was that we got another room and they said they would check the following day as it was late. We never heard from the hotel staff. On the last day just before check out when we were getting dressed to leave we saw a man walking by our windows!!!! So no privacy either. I spoke to the person in reception about the incident but nothing was done about it. Very disappointing staying at the ibis centre guare. Rooms comfortable and modern. Sparse but what would be expected for a budget hotel; its great value. I would advise to avoid breakfast and go to Starbucks over the road, breakfast was poor in both quality and choice. I know its budget, but I have had much better at other Ibis Budget hotels. Coffee machine not working (at least not for coffee), cold coffee in a flask, no fruit, burnt Pain au chocolat. Straight off the TGV into the hotel and a short walk to the Roman attractions. On arrival at your hotel, the Greek-speaking receptionist was very efficiient, however, I think that you should be made aware of the fact that one of your employes was very dishonest. On 1st November, when I returned to myhome in San Francisco, my bank alerted me to 6 purchases made on my credit card with the date of 23 October. I did not make thise purchases so I can only deduct that someone in your hotel used my credit card information for nearly USD1000 of merchandise. My bank is investigating and I will not be responsible for those purchases. I have never had problems before in the 20+ years of using my credit card. It is possible that your employe has a history of stealing private information from clients of your hotel. Excellent value for money. We would certainly return. We enjoyed our stay very much and found this Ibis Budget better than others visited. Room quite large, foot mat for the shower, separate toilet with light activated by movement. My daughter and her 2 girls were in a separate room with only 2 towels for the 3 of them. The main light came on during the night unexpectedly, and so did the television! Breakfast was very good and all the staff pleasant. Simple basic accomodation with excellent staff. We asked for additional pillows and towels which were provided immediately. Good stay. Inexpensive. Excellent location. Helpful to be so near train and bus, and the city centre. Room functional and comfortable. Breakfast adequate. We have found the hotel very easy through the description of the parking access, which had been sent to us from the hotel staff. 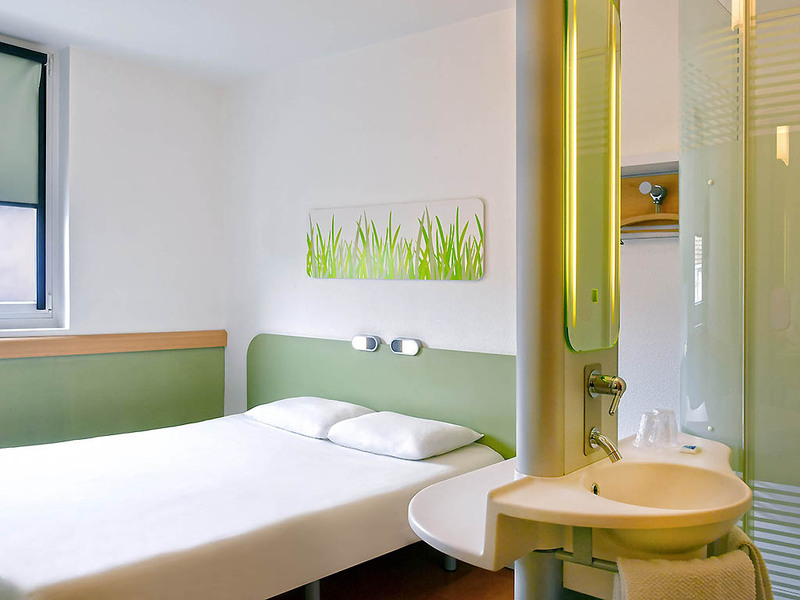 All the rest is what you can expect from Ibis Budget: basic and affordable accommodation, clean room and helpful staff. Excellent hotel, great location, friendly staff - Tolles hotel, gute Lage, alles super! The hotel was excellent. It's really value for money and just one minute from the railway station. And only 5 minutes to the city centre with its Roman amphitheatre. Very clean. Friendly staff. In the same building as the IBIS styles. It is an IBIS Budget and therefore some features are a bit simpler, but therefore it's a good price! great location, great budget hotel. But, please give you clients good directions as we exit the parking garage as to where the hotel is. great locati0n, great budget hotel. But, please give you clients good directions as we exit the parking garage as to where the hotel is. Staff fantastic from welcome to departure. Catered to our unplanned needs for food both in the evening and the morning. Budget rooms had everything we needed, excellent beds, roomy shower, separate toilet, accessible wifi, clever lighting and some space to swing a cat if required. Very friendly helpful staff. Air conditioning was welcome. The no frills room was clean and clinical. It was all right for a quick stopover but with no provision for coffee making or luggage storage or seating (other than on the bed) not ideal for a more lengthy stay. Apart from a toilet smell, it was good. Apart from a toilet smell, it was good. Quiet and clean. The guy at Reception was great. IT was great I could put my medicines in the fridge overnight.